M.E.S.S is short for Motorcycle Engineering Service and Supply and it is my aim to fill the gap between modern motorcycle shops which are in effect just fitting shops and specialist engineering shops which don't understand motorcyclists needs without technical drawings and materials specifications. I tend to specialise in the jobs that most motorcycle shops can't or won't undertake due to the specialised equipment that is required to undertake them, consequently a lot of our work I undertake is from other bike shops, however our services are on offer to everyone at very competitive prices . Originally set up with a business partner back in 2005 when we were located in Tattenhall, near Chester, but due to escalating costs we moved over to Ledsham on the opposite side of Chester, at the same time my business partner due to other commitments decided to leave at the same time as the move which is a pity, as the business was just starting to get regular customers! However, it was not long before the customers started to find me again and things started to pick up and now we are flourishing once more. I have always been fascinated by mechanical things and the ingenious methods employed by different manufacturers to overcome various problems of both operation and manufacture and inevitably I became drawn to motorcycles as they were about the cheapest mechanical things to get my hands on and play with, indeed some people say that I get as much pleasure from fixing them as riding them! I only passed my car test back in 1997 and up until then I used my bikes for all my transport needs, my first passion was for British motorcycles progressing on to Harley Davidsons and now I combine both interests as a mainstay of my business, however I do also keep abreast of all the latest technology employed on the latest Japanese motorcycles. I originally started selling and repairing British bikes, from there I worked for the now defunct Greenlooms Classics but always having a liking for Harley Davidsons eventually started with the old 45 cubic inchers, then onto an Iron head Sportster, then a 1973 Shovelhead which I ran as a show winning bike for over 10 years, all the time picking up faithful customers who I have been repairing their bikes for years, indeed, I used to get a lot of engines landing on my doorstep from people who I'd never even met or spoke to! I eventually got a job at Centurion Harley Davidson in Chester and from there I moved on to Sportster Motorcycles (who still are going strong under the name Bretton Motorcycles) but I realised that I needed to challenge myself with more tasks of an engineering nature as opposed to just day to day servicing and repairs, so I set up again on my own. When I worked at Centurion Harley-Davidson, I obtained certificates in Harley-Davidson servicing and Buell servicing, completing a training course at the training centre in Morfelden, Germany. This is the only formal qualification I have in motorcycle engineering, as when I did my training after leaving school there were relatively few motorcycle courses and those that existed were over subscribed. I however do have many other certificates for car repairs including vehicle technician levels and Motor Vehicle Craft Studies and certification from the RTITB ( Road Transport Industry Training board) These certificates have largely been replaced with the newer NVQ's. I am a firm believer in the "hands on" approach over paper qualifications! I have a healthy interest in EX WD motorcycles, of which I own or have owned including the BSA WM20, the Royal Enfield Flying Flea, The Harley-Davidson WLA 45 and a Matchless G3L I like the rugged simplicity of them and their ability to keep on running with the most abuse and the minimum of maintenance. I also like only having to wipe them over with an oily rag as opposed to polishing them. I should know as one of my own bikes is a Harley-Davidson Heritage Softail Classic (twin cam) and I try my best to avoid riding it in the rain to avoid polishing it!! I always try to lay my hands on new old stock WD bike parts and I'm always on the lookout for them. I am a firm believer in helping out people, so if you have any questions please call me, my theory is that if I help people they will always remember me and the knowledge that I give to them gives them confidence to send me the work if they can't do it themselves, unlike many main dealers whose standard reply is "fetch it in to us" just to get the work. 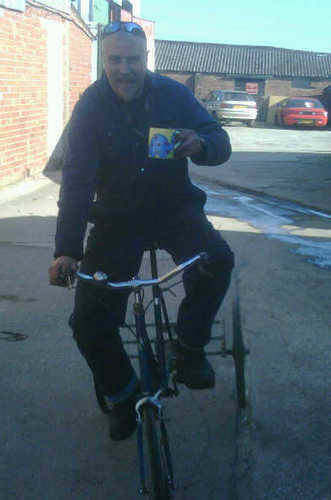 Me, stunt trike rider and tea slurper!!!! !